I scanned a copy of the article and sent it to Ing. Saetti. I was delighted to receive a packet from him a few weeks later, containing a couple of offprints of his own which discussed the same coins as my article.2 I read Ing. Saetti’s articles with interest, and they led to some further thoughts about my article. A silver quarto (also known as a testone; cf. 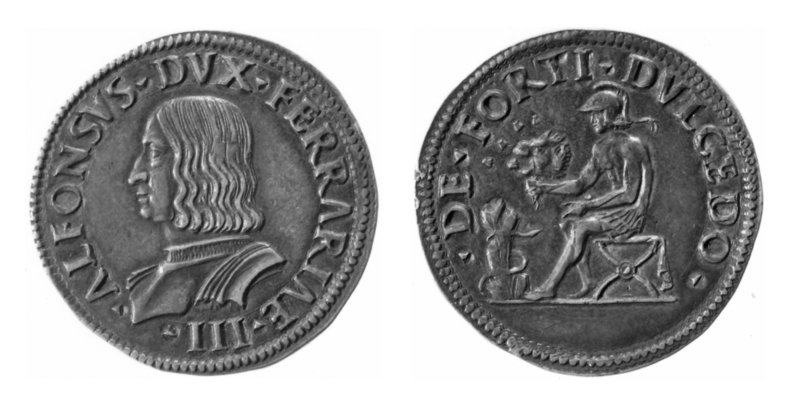 testoon) of Alfonso I d’Este’s, showing the duke without a beard (characteristic of coins minted at the beginning of his reign) on the obverse, with Samson holding the lion’s head and the inscription De forti dulcedo4 on the reverse: one of Corpus nummorum italicorum (CNI)5 nos 21-3, 25-9 or 31. Silver quarto / testone of Alfonso I d’Este, with Samson holding the lion’s head on the reverse (CNI 21); London, British Museum, SSB 102-100.2. © Trustees of the British Museum This work is licensed under a Creative Commons Attribution-NonCommercial-ShareAlike 4.0 International License. I pointed out that the letter is unusual in describing people looking at coins, the form of representation that was probably seen by the most people in early sixteenth-century Italy. Although the terms in which Arienti discussed the representations they carried were unremarkable (people depicted as if they were alive, comparisons with antique art), they are informative. 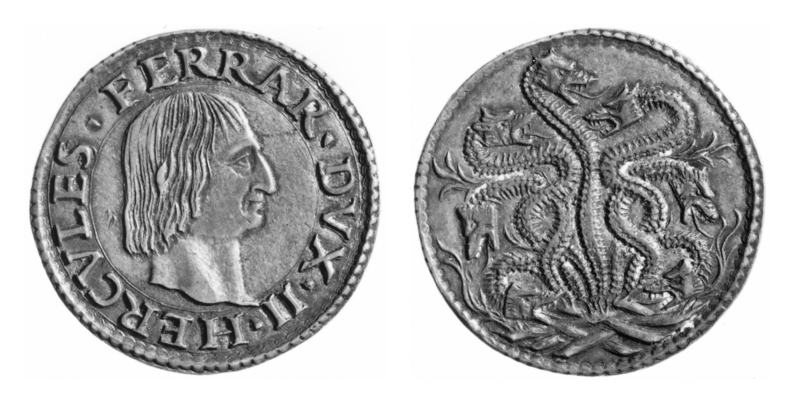 Arienti’s letter also shows that people paid attention to the more symbolic side of coins, drawing attention to the inscription on the double ducat which, to those able to identify the Latin quotation from the Bible, was a clear exhortation to pay one’s taxes – although his misidentification also shows the potential limits of even a more educated viewer’s understanding. And the letter tells us, too, something about the circulation of newly-minted coins between cities and in the aristocratic circles in which Arienti was able to move. 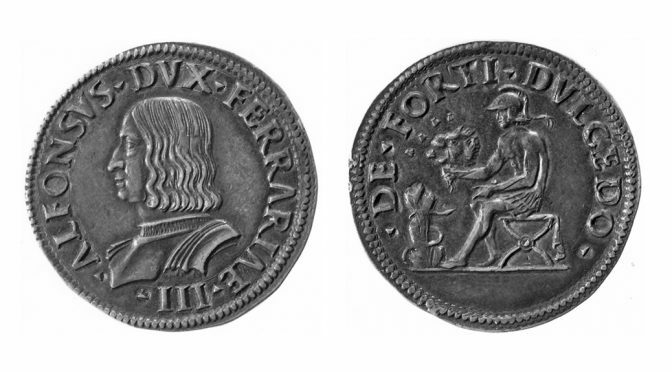 Arienti himself used the coins as a pretext to flatter Alfonso, from whom he hoped for preferment, having served and been aided by his father from time to time; in this, he was unsuccessful, although he did fare better with Alfonso’s sister Isabella d’Este, Marchioness of Mantua. Finally, I suggested that a reference in Arienti’s De triumphis religionis to a gold coin of Ercole I d’Este’s depicting the Hydra on the reverse9 might indicate an unknown striking of a design known only as a silver testone / quarto, or a copper proof (CNI, nos 17-21). Silver quarto / testone of Ercole I d’Este, with the Hydra on the reverse (CNI 21); London, British Museum, 1906-11-3-3881. © Trustees of the British Museum This work is licensed under a Creative Commons Attribution-NonCommercial-ShareAlike 4.0 International License. Ing. Saetti’s identification of these copper versions of coins issued in precious metals as items made to be sent out to interested parties would, as I mentioned earlier, reinforce the possibility that the coins that Arienti saw first were base metal (probably copper) versions of the more precious coins which had been sent to Lucrezia d’Este. As Saetti says, it is entirely understandable that we have records of rulers following the coining of their numismatic portraits with interest, as they were an effective form of propaganda which distributed their likenesses inside and outside their dominions.15 Whether disseminated in precious metals as currency, or in base metals as ‘display coins’, these could provoke the kind of discussion recorded by Arienti in his letter. On another track, I was interested to see that, in his earlier article, Ing. Saetti charts a change, within coins issued in certain Italian mints over the period c. 1400-1520, from what he calls the ‘late-gothic’ art of Pisanello and his school to a growing interest in the convincing depiction of pictorial space.16 Here I would disagree with Saetti, but only in his characterisation of Pisanello’s art. I would argue that, if we consider ‘renaissance’ art to be characterised by a renewed interest in the art of antiquity, then the work of artists like Pisanello, which relates closely to antique and all’antica descriptions of works of art, should in fact be seen as quintessentially renaissance rather than gothic.17 This is not to claim that Pisanello should be associated with an emphasis on illusionistic pictorial space based on the development of a geometrically-coherent linear perspective; rather, that this particular characteristic, primarily associated with Florentine art from the 1420s onwards, should not be considered an exclusive criterion for identifying ‘renaissance’ art. 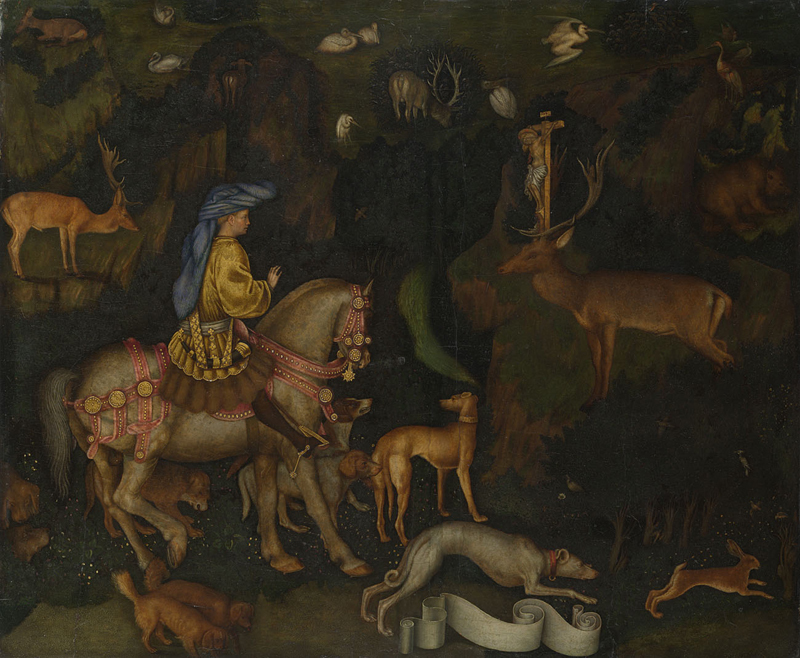 Pisanello, The Vision of St Eustace, c. 1438-42, egg tempera on wood; London, National Gallery, NG1436. Photo © The National Gallery, London This work is licensed under a Creative Commons Attribution-NonCommercial-NoDerivatives 4.0 International License. 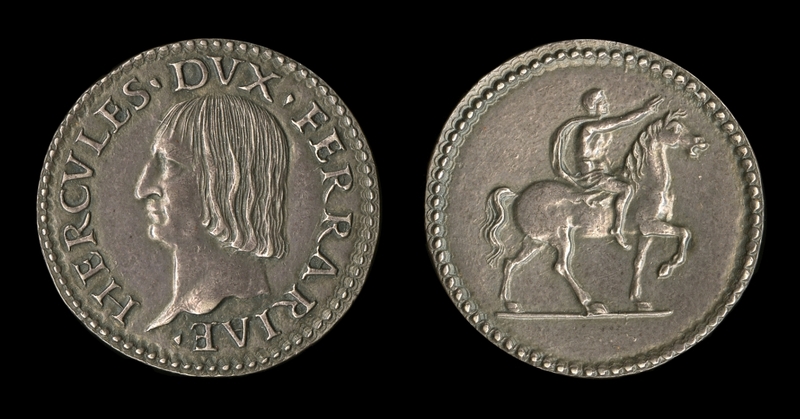 Silver quarto / testone of Ercole I d’Este, with a rider with right arm extended on the reverse (CNI 24); London, British Museum, SSB 102-99.1. © Trustees of the British Museum This work is licensed under a Creative Commons Attribution-NonCommercial-ShareAlike 4.0 International License.